During snow, the airport is responsible for maintaining a safe operating area for aircraft by clearing runways, taxiways and other surfaces. The Federal Aviation Administration (FAA) is responsible for safely spacing out arriving and departing aircraft, and the airlines are responsible for managing their own schedules and ground handling operations. 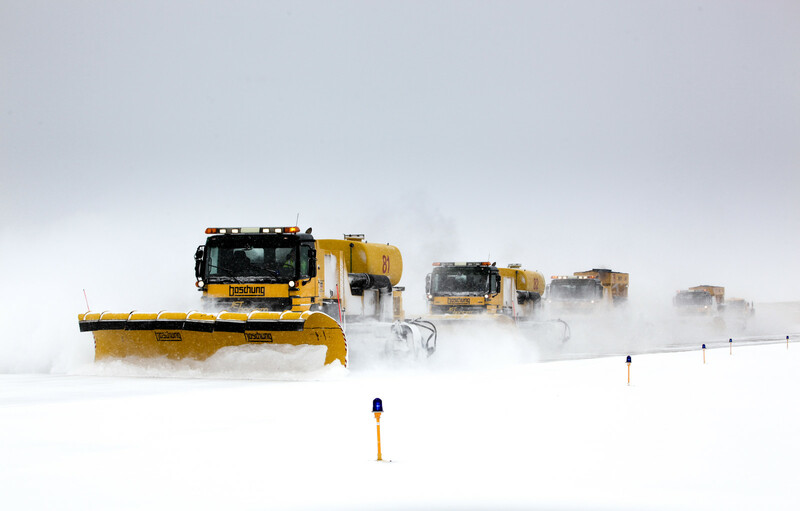 The airport has snow removal operations “airside” (runways, taxiways, and ramp areas) and “landside” (Peña Boulevard, parking lots, and additional roads). Here’s a look at the key facts and figures when it comes to managing snow at DEN. DEN has approximately 500 trained snow removal personnel. There are now nine teams dedicated to specific areas of the airport, compared to three teams in 2006. After the 2006-2007 snow season, DIA revised its snow plan to include prioritizing snow removal.For example, critical taxiways and runways are identified as Priority 1 and other less essential pavement is de-prioritized. DEN has approximately 250 pieces of airside snow removal equipment (includes contractor equipment for ramp areas) and 120 pieces of equipment for landside parking lots and roadways. The equipment includes: blowers, brooms, blades, plows, runway sanders, snow melters, 5,000-gallon chemical trucks, loaders with box plows, bobcats, and bobcats with box plows. Following the 2006 blizzard, DEN purchased multi-function machinery that can plow, sweep and blow snow, and some spread liquid and sand products at the same time. This year, the airport has invested in five new pieces of state-of-the-art multi-function equipment. These machines each cost $640,000. By using multi-function pieces of equipment and making other improvements to snow management, the airport has reduced the average amount of time needed to clear a runway from 45 minutes to under 15 minutes. DEN melts the snow that is cleared from the ramp areas, near aircraft gates, since it’s not feasible to store all that snow in piles. The airport has two different types of melters – 10 melters that melt 600 tons of snow per hour, and one that melts 150 tons an hour. The airport uses a product called Apex, which is similar to magnesium chloride, to treat landside pavement. When temperatures dip below zero the use of chemical is discontinued and sand is used to help with traction. Potassium acetate is used to treat runway and taxiway surfaces. A plane's wings and rear tail component are engineered with a very specific shape in order to provide proper lift for flight. Snow and ice on these areas in essence changes their shape and disrupts the airflow across the surface, hindering the ability to create lift. Deicing removes snow and ice for safety. At DEN, aircraft deicing is handled by airlines or their contractors, not the airport. But DEN has invested in cutting-edge technology that is reducing wait times at the deicing pads and saving the airlines money via reduced fuel burn. Initiated in 2014, a custom computer program called the Aerobahn Deicing Manager helps the airport and airlines predict the best time for each aircraft to push back from the gate, how long it will take to taxi to the deicing pads, how long it will take to deice, and how long it will take to taxi to the runway for takeoff. This program’s use during a typical snow event will reduce airline delays by 2.6 minutes per aircraft and total costs by $88,000. This amounts to a savings of $5.8 million per deice season by improving efficiency and reducing wait times at deice pads. About 48-64 aircraft can be deiced per hour. Deicing throughput can’t exceed the runway capacity at any given time. Runway capacity is dictated by the FAA based on weather conditions. Aircraft Deicing Fluid (ADF) is made up of a chemical called propylene glycol blended with water and additives to allow it to effectively remove ice and snow from aircraft before departure. The cost of fluid varies widely due to market conditions, but is generally $8-$12 per diluted gallon. Glycol is collected at the airport and is recycled into windshield washer fluid and other consumer products. DEN has one of the most comprehensive deicing fluid collection and recycling systems in the world, boasting an average collection rate of about 70 percent of all fluid applied to aircraft in a typical winter season. DEN has 70 million gallons of storm water retention capacity across 13 ponds. On-site storage infrastructure allows for efficient operation near departure runways and helps keep ADF out of the storm water system. From the 2010 to 2015 snow seasons, DIA received an average of 54.3 inches of snow each season.